Done by Den: House Mouse Sketch. The hi-light of my year! I am still waiting for my delivery of new stamps from America so meanwhile I am using old favourites. Following this sketch was a pleasure and I am delighted with the end result. Beautiful card!!! I love the colors!!! Great card! I really love that HM image. Very sweet! I don't think I've ever seen this stamp before! Awww this is so sweet! Love the softness. You should indeed be delighted with the end result -- because it is a joy to behold. Old favorite stamps are good -- but new ones are exciting. Hope you receive your new ones soon so we can see more of your beautiful creations. Rainbow Lady Challenge "magical & mysterious"
Cute Card Thursday Challenge "Stars at night"
Cuttlebug Challenge "emboss on patterned paper"
Arty Girlz Challenge "blue & orange"
My Time To Craft Challenge "personalise it!" High Hopes Challenge # 4 "Anything But!" 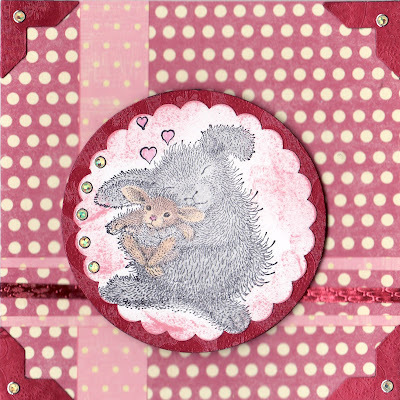 Tanda Teaser Challenge "Kids Kards"
Many Thanks Grumpy Jack & Ann! My Time To Craft Challenge "GET DOODLING"
Rainbow Lady Challenge "Own Choice"
Arty Girlz Challenge 56 "Numbers"
Tilda & Co challenge sketch. Dutch Dare Challenge " Christmas Card Stock"
High Hopes Challenge 3 "Sewing"
Cute Card Thursday Challenge "buttons and bows"
Cuttlebug Challenge "Use 3 Embossing Folders"
High Hopes Challenge # 2 "Colour Combo"
Tilda & Co Challenge "Arts Apart Metal"
House Mouse & Friends Challenge "Halloween"
Artygirlz Challenge 55 "CLIP ART"
Dutch Dare Challenge # 17 "Wild Animals"
Tanda Teaser "Just for you"
Rainbow Lady Challenge # 33 "Bandana Tech"
Cute Card Thursday Challenge "Christmas Animals"
Arty Girlz Weekly Challenge "RED"
House Mouse & Friends Challenge #7 "TAGS"